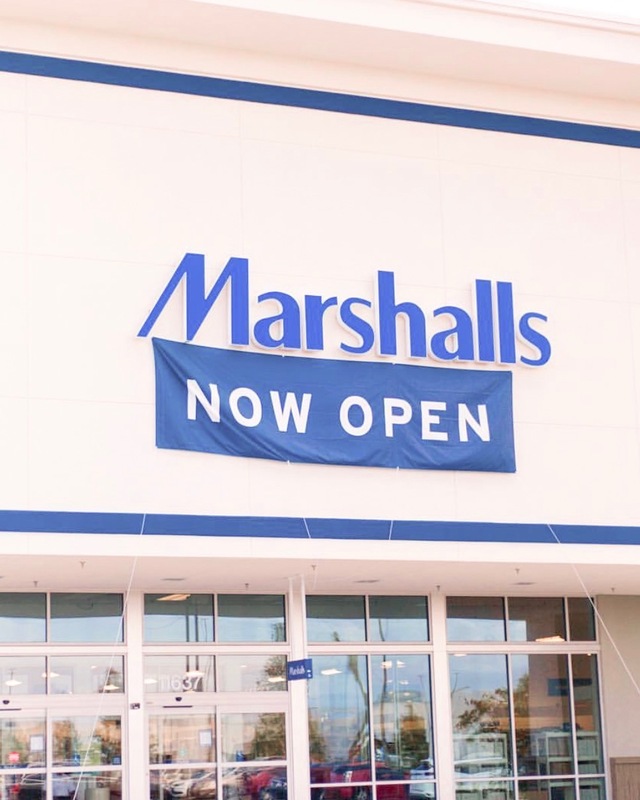 This post is sponsored by Marshalls on behalf of their Grand Opening at Vineland Pointe, Orlando. All opinions are my own. 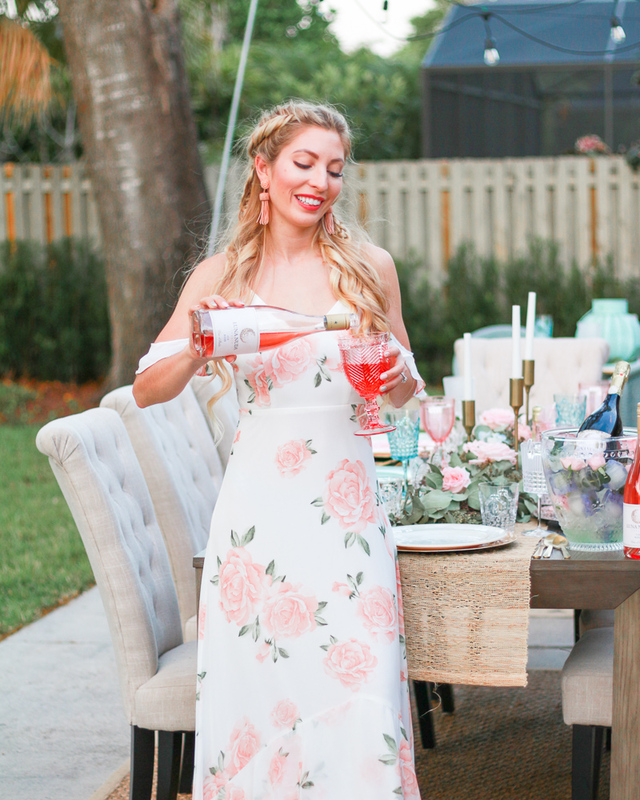 I have always been a girl with champagne taste, but on a beer budget, so when it comes to shopping, I try to always hunt around for the best prices. One thing I love is shopping at stores locally because I know I can find some of my favorite designers at amazing prices. 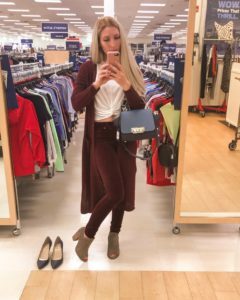 I went out over the weekend to check out the new Marshalls that opened near me in Orlando and it’s bursting with fall designer styles. There were so many great sweaters by brands I love! I also found some amazing denim options like these designer burgundy velvet skinny jeans that I’m wearing here. These pants were originally about $200 and I got them for just under $70! That is an amazing price! The jeans were the first piece I found that I knew I was going to buy and I decided to complete the entire look based off of burgundy. I looked around and found the cutest long line cardigan that was only $14.99. Then I headed towards the dressing room and stopped at the purses on the way. The handbags section is definitely my favorite place to shop at stores like Marshalls. They have some of the hottest designer styles and brands; I just end up wanting to take it all home haha. When I saw this gorgeous blue Italian leather bag at the incredible price of only $199 compared to $495, I knew I was getting it. 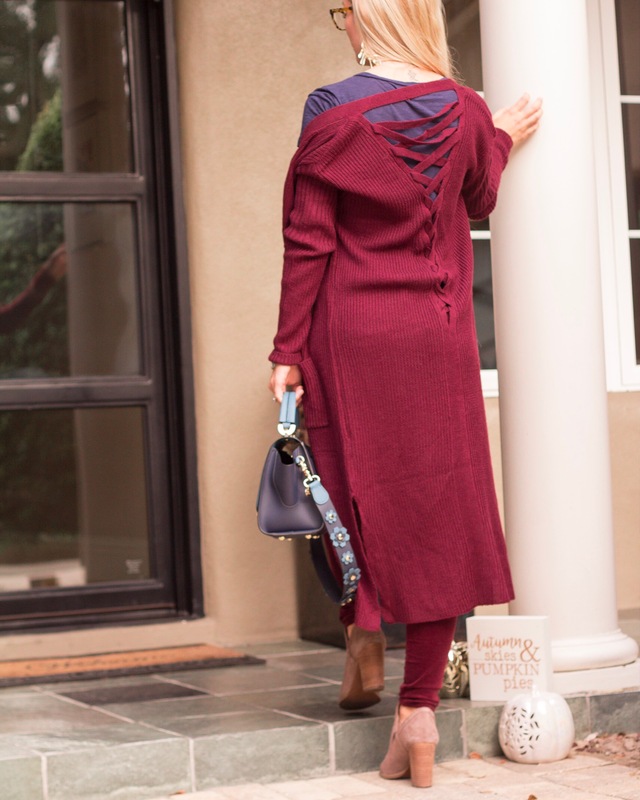 Burgundy and Navy are two of the hottest fall colors, so I thought it would be fun to mix the two in a look. I was having a hard time choosing between the navy pumps and the grayish/taupe booties. Luckily ya’ll on Instagram sent me enough DM’s to help me choose and I snagged the last pair of booties in my size. Guess how much they were…less than $50! I even grabbed a few fall decor items when I was in line on the way out of the store. I am such a fan of fall decor compared to Halloween. These little pumpkins light up, so I can’t wait to get my landscaping finished in order to decorate the front door area. Marshalls, I’ll be back soon! 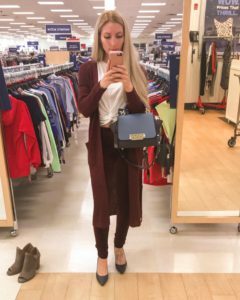 Have you shopped at Marshalls before? 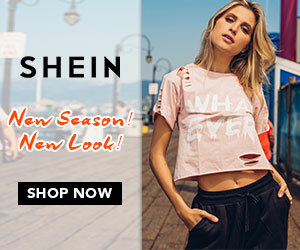 If you haven’t you really should go visit one near you and see what the hype is all about, and check out the designer styles near you! I don’t know about you, but I like to have my cake and eat it too! Love what you found!! Those pants are amazing! I love the colour!! That bag!!!! I love finding a good buy!